Many of you wont know this but Fashion Blogging isn't actually my full time occupation, I work as at Nestle in the Marketing department. My days are filled with endless emails and meetings about the wonderful world of chocolate. This means I am always on the hunt for pretty and sophisticated work wear to make my days as fashionable as possible. Cue TwentyFour Fashion, a fashion company who's brand ethos is to create on trend, chic clothes that are easy to wear day or night, out to functions or just for fun. TwentyFour Fashion is fuss free and accessible without compromising on style or quality. I chose to style the beautiful Celina Silk Suit which is the ultimate in modern soft tailoring. 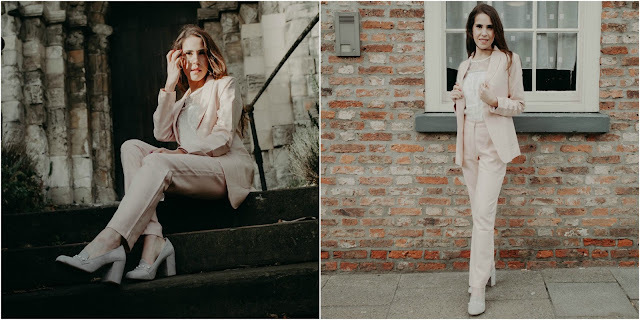 The simple cut of the jacket and the slim fit of the trousers are complimented by the soft pastel pink colour. I don't know about you but the effortlessly glamourous style of this outfit would not just be good for work but could be dressed up for a night out too! What every girl wants, an interchangeable outfit to take you from business meetings to the Bar! You can buy the outfits online from their website or ASOS Marketplace. Please check out there Instagram, Twitter and Facebook! Hope you enjoy having a look through their wonderful pieces.